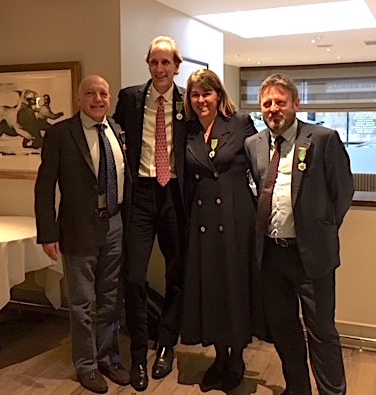 Four members of the UK trade were honoured with the ‘Ordre du Mérite Agricole’ at a ceremony in London this week for their work in supporting the French wine industry. Legendary sommelier Gerard Basset OBE MW MS, former Sopexa managing director Anne Burchett, Edward Squires of Dedicated Wines and Stephen Browett of Farr Vintners were given their awards by the French ambassador to the UK, His Excellency Jean-Pierre Jouyet, at W8 restaurant yesterday (8 January). The occasion was particularly important for Basset who was determined to make it between his treatments for the cancer that he has been battling for the last few months. He said: “It is always humbling to have one’s work acknowledged and I am truly honoured to receive the ‘Mérite Agricole’ today.